It’s that time of year when the “hustle and bustle” of the holidays begins in full force. You may feel like your to-do lists for decorating, shopping, and baking will never end! 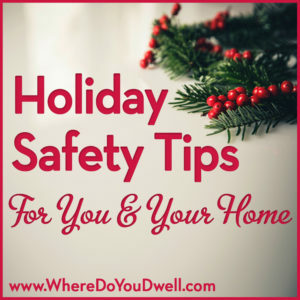 We want you to have a safe and happy holiday season and that’s why we have one more “must-read” list that you should NOT skip: Our handy guide to keep your home hazard-free for you, your family, and any guests. Whether you own your home or currently rent, now is the time to make sure you’re prepared and aware of any unique hazards that tend to come up at this time of year. That way you’ll be all set to invite your peeps to your annual holiday bash or even host your out-of-town guests, who may also have children and pets. Test and check your batteries in all smoke and CO detectors. If your detectors have been around for more than 10 years, they are past their prime. Replace them and add fresh batteries. Purchase a fire extinguisher and mount it centrally in your home. Know how to use it! Never leave a space heater unattended and, better yet, buy one that automatically shuts off. Have a fire escape plan for your family (and any guests) whether you’re in a house or on the 10th floor of a condo building. If any guests smoke, create a designated area outside with ashtrays and have a place for them to safely put out cigarette butts. Douse those butts with water before discarding. Artificial trees should be labeled “fire resistant.” It could still catch on fire but it will be more resistant to burning and spreading a fire. Check to make sure a natural tree is fresh, with green needles that are hard and don’t break easily, and the trunk should have a sticky resin on the bottom. Needles should not fall off if you tap the tree on the ground. Cut two inches off the trunk and put it in water when you bring it home. Keep the stand filled with water by watering your live tree every day. Don’t forget or have someone else do it for you if you go away. Avoid using old-fashioned metallic trees since they can pose an electrocution danger. Even if you like retro trees and even ornaments, the safety requirements are mostly outdated. Place your tree away from fireplaces and radiators. Make sure your tree is securely anchored and won’t tip over, especially by small children and pets. Don’t block doorways or passageways or make it too tight for decent room flow. Only use lights with the UL seal of approval and purchase them from a reputable store. Consider buying LED lights since they don’t produce as much heat and use less electrical current. Inspect your lights — new or old — for frayed or bare wires, broken or cracked sockets, loose plugs, and excessive kinking. Throw out damaged sets and replace burned-out bulbs. When replacing bulbs, unplug the light string and be sure to match voltage and wattage to the original bulb. Plug lights into a surge protector rather than straight into an electrical socket to avoid any electrical hazards if the lights short out or if there’s a power surge. To prevent overheating, plug in no more than one extension cord per socket and string no more than three sets of traditional lights together. When using an extension cord, make sure it is rated for its intended use. Make sure it’s safely out of the way of any traffic flow. Never use lights on metallic trees. Make sure outdoor lights have been certified for outdoor use. Outdoor lights should be plugged into circuits protected by ground fault circuit interrupters (GFCIs) to protect against electric shock. This device cuts off the current if a leak is detected; without one, a damaged wire can transfer electricity into water or metal, making it “live” and dangerous. Consider buying a timer for Christmas lights that automatically turns them off at set times. Keep burning candles in sight, or use battery-operated or solar-powered ones. There are more products with better “flames” out there to choose from! Use non-combustible, flame-resistant materials for your decorations. Remember retro or vintage ornaments could pose a danger. Perhaps put them in a bowl or scattered as table decorations rather on a lighted tree. Hang all glass and breakable ornaments near the top or middle of the tree to avoid children and pets grabbing them. Instead of hooks consider using ribbon to tie ornaments on branches. Children and pets can choke on hooks. Make sure your tinsel doesn’t contain lead, which can be poisonous if swallowed. Maybe Grandma likes to save her tinsel from previous years – keep it away from small children and pets. In homes with small children or pets, avoid sharp or breakable decorations, those with small removable parts that could be swallowed, and any trimmings that resemble candy or food that might be eaten. When hanging decorations high up on trees or stringing lights on your home, make sure you use the correct ladder height and you’ve got someone to help you hold the ladder. Place a screen around your fireplace to prevent sparks from shooting across the room. Never ever burn wrapping paper since it can ignite suddenly, resulting in a flash fire. Remove any flammable objects nearby, such as wrapping paper, decorations, etc. Hire a professional to clean your fireplace before you decide to light it this season. Mistletoe, poinsettias and holly plants are poisonous to pets and children if ingested. Place them up high or outside. Lock up any medications and cleaners to keep children visitors safe. It’s a good idea to do a walk-through of your home for any hidden hazards for young guests. Make sure area rugs have a non-skid backing to avoid slips; and keep walkways clutter free to prevent trips, especially by elderly visitors. Use a hall nightlight to help overnight guests find their way to the bathroom. If you expect to have packages delivered to your home while you’re at work, have a plan in place to avoid having them left for hours on your stoop. Check with neighbors who can watch out for deliveries, have them delivered to work, or have them shipped to the retail store for a pick-up. Don’t forget about Amazon Locker locations in the metro area that will hold packages! If you plan to go away for a few days – put lights on timers; have a friendly neighbor shovel the walk if it snows, pick up your mail, and put out the trash so your home looks lived in; move gifts away from front windows where they can be easily seen; and always lock up. If you buy large expensive gifts, such as a big screen TV, cut up the boxes and put in trash bags before putting out on the street for trash pickup. You don’t need to let others know what goodies you got this year! Now you’re all set to enjoy a safe and happy holiday season … Merry, Merry! Download our handy PDF sheet to print out or store on one of your devices. And let us know if you have any questions!